What is Qi (Chi) / Prana? The Seven Chakras and Nadi energy channels. 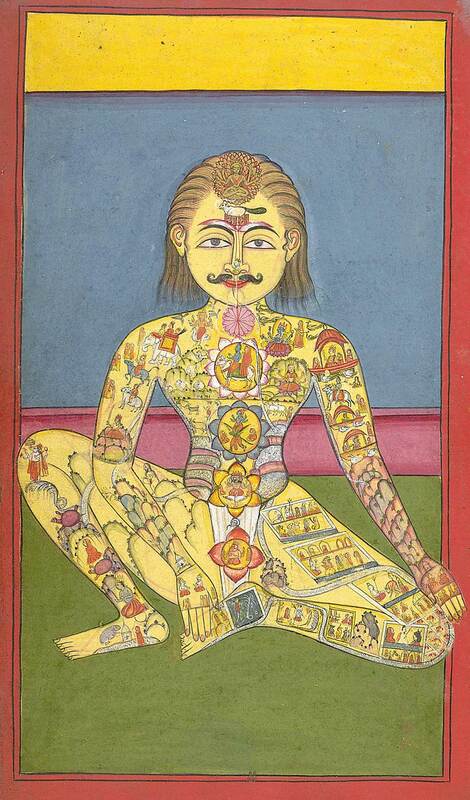 (Chakras are similar to the dantian qi energy storage locations in the body). 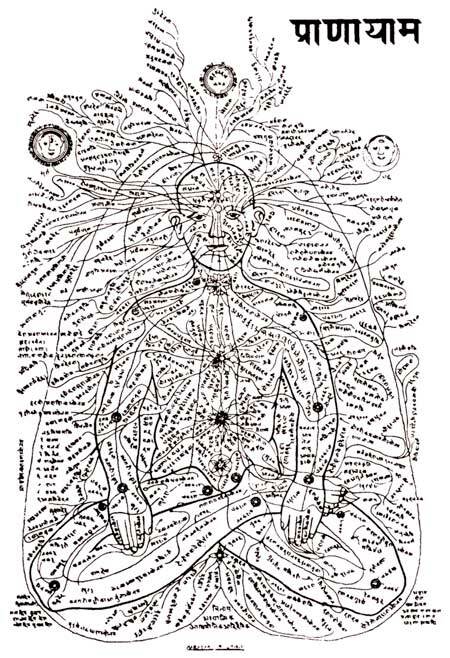 The nadis are similar to the vessels and channels (meridians) of Traditional Chinese Medicine. A Map of the Nadi Subtle Energy Channels. 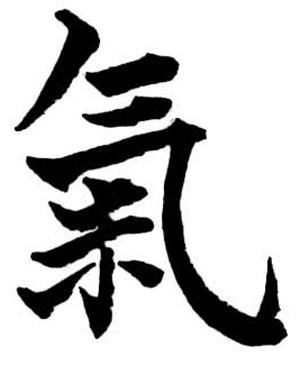 The Hindu Nadi is similar to the Chinese Jing luo; i.e., a vessel or channel of qi/prana energy. In the west they are also called "meridians." Qi or prana is also known as life energy, life force, ki, bio-energy as well as found under many other names, depending on from where you hear it. For millennia, prana/qi energy has been known to every single nation (big and small) and every culture in almost all parts of the world. It's just that some of them explored it and some did not. Those who did, discovered a whole new world and those who did not, ended up knowing next to nothing. Unfortunately, the latter is the case with us westerners. But, it seems, it's all changing now, primarily thanks to the growing interest in the subject, not only among the wider public but also within the scientific community as well. Advancement in science and technology in recent years has become another important contributing factor. At last we are able to deal with something so extraordinary, and even though limitations are still huge and those first steps tiny and shaky, we are making some progress. Many phenomena once ignored, due to the inability of our science to tackle them, are back on the researching table. East is meeting west in the best possible way and at the best possible time. There is more freedom, more cultural exchange, and dramatically increased speed of spreading information through the internet and digital multimedia to (and from) any part of the world. You don't have to be a psychic any more to be able to see auras (i.e. qi energy/prana) around people. There are many devices that can do that, as well as some others that can detect the qi energy of acupuncture points and meridians. Some can measure the qi energy of other living organisms such as plants and insects (known as Kirlian's photography). What is interesting here is that Kirlian photographs are showing full energy images not only when the whole plants were photographed but even when the shots of their individual parts - such as leaves or stems - were taken. Apart from that, there is more and more insight into what qi energy/prana consists of and it seems to vary greatly depending on its source. For example human qi energy/prana will be different to qi energy/prana of animals and plants but it will also be very different if coming from a person with a strong constitution as opposed to someone with a weak one, or say coming from a healthy person as opposed to a sick one, from a spiritually advanced person as opposed to someone neglecting that aspect of life, from somebody regularly practicing qi energy (such as through Qigong) as opposed to someone who is not and so on. Numerous experiments and studies done on qi energy in the last thirty years in China have demonstrated the presence of a mixture of electromagnetic field, infra red light, ultraviolet light, even traces of visible light, alpha, beta or gamma rays etc. It is also noticed that the electrical resistance of the skin where acupuncture points are located (i.e., where qi energy is exposed to the outside environment) is much lower than elsewhere on the skin. So, apart from the obvious (i.e., anybody who is capable of thinking can see the difference between living organisms and dead bodies), there is plenty of scientific evidence of the existence of qi energy/prana. Yet, there are still many who wouldn't change their convictions simply because they are faced with plethora of facts. And so, while some people still find the need to argue about the existence of qi/prana and theorize about it, in China, India and Tibet for more than five thousand years qi/prana has been practically and very successfully used to treat all sorts of diseases, prolong life and by fine tuning it to perfection (i.e., the so called 'process of qi energy/prana purification') even reach enlightenment as the ultimate goal of human existence. As a matter of fact the qi energy concept is so complex and deep that the whole system of traditional Chinese medicine, one of the oldest and most developed medical systems in the world, is entirely based on it (this is in relation to western medicine, which is based on anatomy and physiology, in other words on matter and its chemical reactions). I am, and always was, a great skeptic. You can tell me anything you want, but unless you prove your claims to me, I am not going to believe a single word you say. And that is exactly what happened when I was introduced to the concept of qi energy in Chinese medicine. I heard it all and while many others just shook their heads and left, I stayed – just to prove that there was no such thing as qi. If qi energy did not exist how come millions of people every day are successfully treated in China by a Chinese medicine entirely based on it? Including various modalities like Qigong, acupuncture and acupressure which directly deal with qi. If qi energy did not exist how does one explain that this has been going on for more than five thousand years? No false theory can last for more than a year unless forcefully applied by some ruling party. Well, Chinese medicine practitioners not only never ruled China but, on contrary, were under all possible unfavourable rulers (who at times placed harsh restrictions, even banned its practice altogether) including early feudalist rulers, emperors (both Chinese as well as foreign), capitalist governments and the communist regime. According to western medicine, apparently, there is no such thing as qi or prana energy inside the human body, it's all just pure matter and chemistry. Well then, how come, despite it being so sophisticated and highly developed, up until now, science has never been able to produce life in a test tube, it never was and never will be. You have to have life to create life, the same as you have to have matter to create matter. Neither of the two can be produced out of nothing, nor can they be destroyed. They can only change into another shape or form. Those cloned animals like our dear sheep Dolly were cloned from some other living cells, and not produced from any non-living matter. If qi energy did not exist how come it is more effective than western medicine in the treatment of vast majority of illnesses (especially the chronic ones)? Numerous studies done in the last fifty years in China and published in thousands of books and scientific journals are there plain to see for all those who want to see it! If there were no qi energy I definitely would not have been able to practice Chinese medicine for so many years. Not to mention that I have already taught thousands of people all kinds of qigong and I'm constantly getting more students through the word of mouth. If there is no qi energy why was I able to cure myself from juvenile hypertension, psoriasis, and severe acute appendicitis (without an operation) as well as no longer need glasses that I wore for seven years prior. For more details click here: How Chinese Med Changed My Life. Research on qi energy is still in its infancy and there is much to be discovered, learned and unlearned before it is able to explain why Chinese medicine works or from where the amazing powers of Qigong masters come. For example, many masters of Qigong can not only see qi energy, popularly known as auras, its different colours and layers, but have also developed X-ray vision (i.e., are able to see the inner organs, bone structure, presence of tumours or lumps, can detect pregnancies etc. ), microscopic vision (as the name suggests, the ability to see objects of microscopic size by magnifying them somehow without the use of a microscope or similar devices), telescopic vision (seeing objects at a distance far away from them) and can manipulate their own qi energy in many different ways – for example making their aura shrink, or expand to enormous proportions, change its shape, or colour. Plus, they can see acupuncture points and the pathways of acupuncture meridians on the human body, how they are connected with each other and with the inner organs, where the blockage of qi energy is present and so on. The spelling of Chi was changed to Qi in accordance to the stylistic requirements of qi-encyclopedia. Prana and qi are similar in their respective overviews of human and universal vital energy, but what does differ significantly is the respective two cultures, Indian, and Chinese, that each come from. Each term is totally infused with the zeitgeist of its native land; so although they are in certain experiential ways the same, nevertheless, they are described and practiced in very different manners. This article uses the word form "qi/prana" in an attempt to bridge that gap.